The classic Three-Tab shingle has been around for a long time. 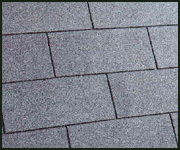 A Three-Tab shingle is usually the most economical choice for homeowners or property managers to roof a home. A great deal of homeowners in today's market are replacing their aging three tab shingles now. It's easy to tell three tab shingles by their flat look. Three-Tab shingles have their share of advantages, however the primary reason they seem to be chosen is price, and price alone. They are certainly the value leader in the residential market. Thankfully, they are still prevalent in most home centers and commercial roofing distributors. You can probably find just about any color family you need to fit your home's aesthetics. The most common Three-Tab shingles come in 25 and 30yr varieties, however you can find these in shed shingles rated to last down to 15 years or so.